The series shows the underground rap culture of Athens. Young people, most of them unemployed, celebrate their Saturday night rap session, right in front of an ancient university building. The economic crisis in Greece has left an unemployment of 57 percent of young people up to an age of 25 years. Having no money, they do not have access to most commercial cultural events. But their creative power makes them invent various forms of self-made entertainment. 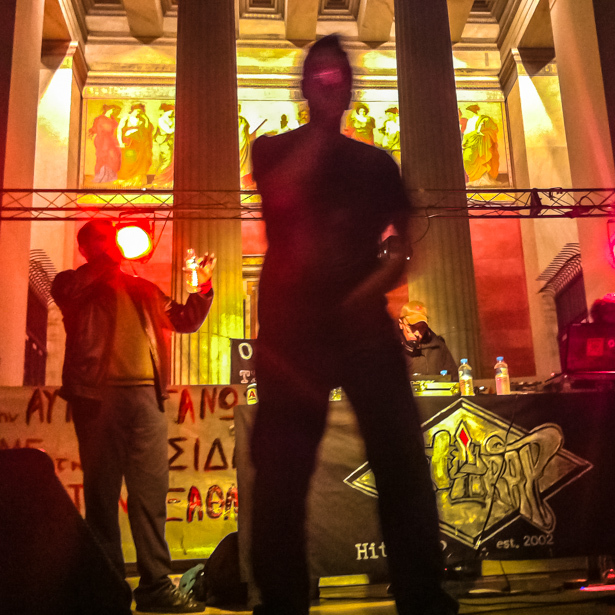 Every weekend the rap scene of Athens occupies public places. Everyone can participate, most songs deal with politics, radical anti-racism is common sense of the actors and the audience. Gathering and performing in urban spaces, these young, creative, and highly political activists might re-enact the Greek invention of democracy in the "polis". The photos show a vivid and burning atmosphere of Athens' rap scene. The series is part of my long-term project on the crisis in Greece.